The CBD industry, though shrouded in controversy, is quickly growing into a massive supplement market. Unfortunately, many products labeled as containing CBD may, in fact, contain very little or no CBD at all; others may contain unlabeled and unlawful levels of THC. In an industry where 69% of CBD products are mislabeled, how do you find the good stuff? Cannabidiol, or CBD, is a natural extract derived from hemp or marijuana plants. Legal in all 50 states to buy, sell, and be in possession of, CBD products must be sourced from cannabis strains of less than 0.3% THC. Though manufacturers and retailers are subject to strict farming and extraction regulations, US-made CBD items are still not recognized as dietary or medical supplements by the FDA. CBD products come in a wide variety to choose from, but finding the method that’s right for you and your needs may be tricky at first. For those suffering from insomnia or chronic headaches, fast-acting dosage methods like vaping or oil tinctures are particularly useful. But for long-lasting effects to help relieve anxiety or chronic pain, patches or infused edibles maybe be the better choice. The work doesn’t end there, however – here’s how to find a manufacturer you can trust. Because CBD is unregulated by the FDA, products don’t have to conform to industry-wide labeling standards. While some manufacturers of ore CBD products choose to follow the labeling guidelines set by the FDA for supplements and vitamins, it may not be enough to ensure the quality and integrity of the product itself. Generally speaking, it’s the more expensive products that are likely to be of higher quality; it’s unlikely that you’ll find a “good deal” on CBD gummies at your local corner store. Luckily, reputable manufacturers will make it as simple as possible for consumers to navigate products through transparency. In an industry where labeling mishaps commonly occur, independent third-party lab testing can help dispel or confirm any concerns not the quality of products. These tests will reveal the potency of the product, the THC content (if any), and list the presence of contaminants. There is a lot of misinformation surrounding the CBD industry, and poor labeling standards and incongruities certainly don’t help. 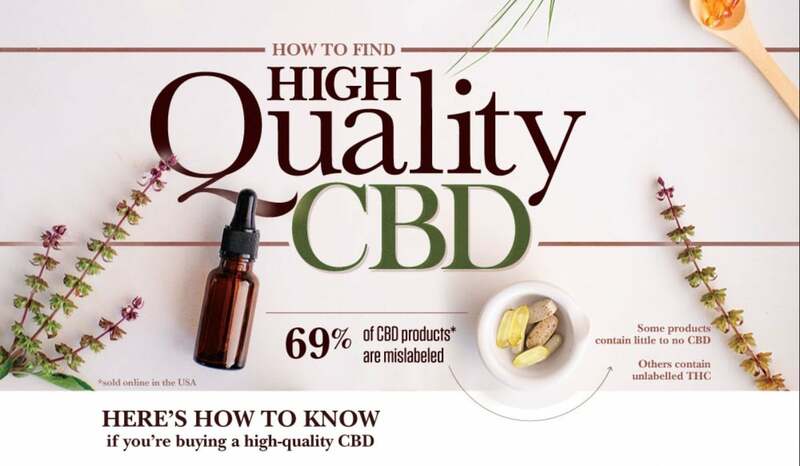 This infographic details the steps to take when looking for quality CBD products, how to spot red flags from manufacturers and products, and the due diligence it takes to find the products that are right for you.